Nigeria’s Acting President, Prof. Yemi Osinbajo on Monday signed the 2017 budget of N7.441 trillion into law. Osinbajo made it public on Twitter. He wrote: "I just signed 2017 Budget into law. It's an important milestone in our economic recovery & growth plan laid in April by President Buhari." This comes after Osinbajo reportedly got the nod of the President Muhammadu Buhari who has been abroad for treatment for over 2 weeks now. “Following the receipt of a full brief on the 2017 Appropriation Bill as passed by the National Assembly, and to buttress the unity at the highest level of government, President Muhammadu Buhari has indicated that it is in the interest of the nation’s economy for the Acting President, Professor Yemi Osinbajo, to sign the Appropriation Bill into law,” Garba Shehu, the senior special assistant to the president on media and publicity had said. 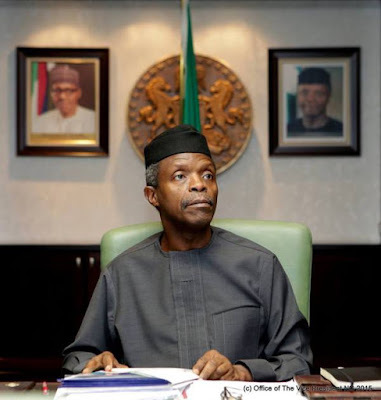 There had been controversies that Osinbajo cannot sign the budget forcing acting President’s spokesperson, Laolu Akande, to clear the that doubt on May 18 when he said Mr. Osinbajo would sign the bill once satisfied with its content. “Just so we are clear: when the time comes, everything is set, and he is satisfied, Ag. President Yemi Osinbajo will assent to the 2017 Budget,” Mr. Akande tweeted at the time. The National Assembly had last passed the budget, increasing the total sum by N143 billion compared to what was sent by President Muhammadu Buhari.